1) This Saturday, hundreds of thousands of women marched in cities across the country and the world to protest Trump’s inauguration. 2) These were not women united in purpose. Some marched for reproductive rights and equal wages, while others marched in concert with black and brown, indigenous and Muslim women. Some marched for transgender and queer rights and refugees and undocumented humans, others did not. I am out here hoping that most women who march do so while centering historically neglected demographics, but I worry this is not the case. 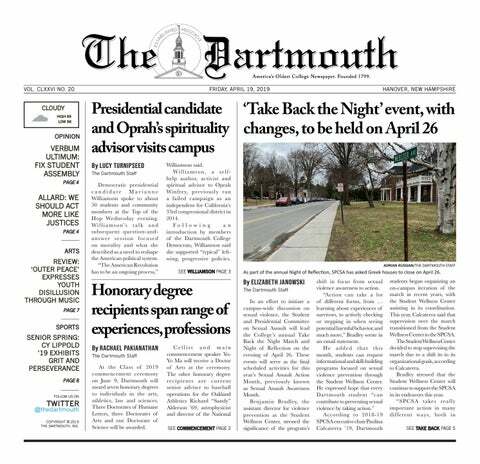 3) I worry because more people showed up to the Dartmouth march the day after Trump won the election than showed up for #BlackLivesMatter events on campus, for the vigil for trans lives and the Armenian Genocide, for the #noDAPL protests and the Divest Dartmouth rally. I’m not saying that people need to show up to every single justice event to show that they care, just that those events with tangible causes and effects (dead black, trans or Armenian folks; ruined sacred indigenous lands; protection of the environment) have significantly lower attendance than protests of nebulous causes. When you march, what do you march for? And if the answer is anything other than yourself, why don’t you put your body on the line for the causes of others? A lack of specificity means a movement grows because the people aren’t out there for each other — they’re out there for themselves. 4) Comedy requires trust. For a moment, the person telling a joke makes herself vulnerable in the hopes that the listener will find her funny. 4a) Unlearning requires trust. The white feminist must trust the experiences of women of color, queer and trans individuals in order to empathize with them. 5) I am interested in the rhetorical potential of the joke. We already know that laughing can heal. But can laughing convince? I think it would be very hard to build an argument using only jokes, but they do hold a coquettish potential to convince. How jarring it is when your enemies make you laugh. 5a) This gets difficult when we talk about divides so big it seems like no joke can bridge the gap. 7) I used to find Amy Schumer funny. I still find a fair amount of Lena Dunham’s “Girls” funny. The joke is sometimes representation — mostly white women with the occasional token friend of color — but sometimes it’s also jokes that rely on stereotypes. A friend of mine once said that a good way to shut down an offensive joke is to say, “I don’t get it. Can you explain it?” Quickly, it’s revealed to be structured on old tropes. Aside from perpetuating harmful images of “othered” populations, offensive jokes are lazy. It’s not difficult to rely on a convention that’s constructed for you by media, news outlets and hundreds of years of the same joke. Try harder? 8) Pointing out that white women were centered in the march is not a way to divide the movement ­— it’s a form of survival. Historically, centering white women means that women of color, trans individuals and queer women do not benefit in the same way white women do. Centering the marginalized populations is a safeguard against this. 8b) Suffrage marches often had a segregated unit for black women, at the back of the march. 10) If it isn’t intersectional, it isn’t feminism. And intersectional comedy is better. Laugh with the intersectional feminists. We’ve got jokes. 10a) Caring about intersectional feminism means caring about people affected by these issues. There is obviously an order here: come for the solidarity, stay for the laughs. If you come for the “lols” without adopting the praxis, you’re missing the point.